Home > Frugal Living > Frugal Recipes > Menu Plans: June is National Fresh Fruit and Vegetable Month! Menu Plans: June is National Fresh Fruit and Vegetable Month! 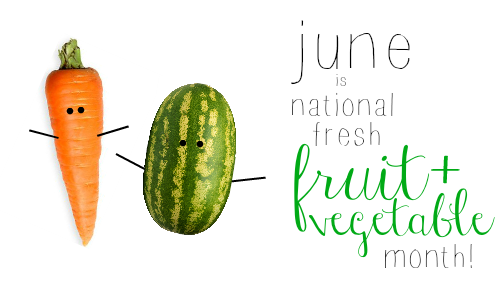 In celebration of all the produce that the summer season brings us, June has been designated as National Fresh Fruit and Vegetable month! You can save the most money on produce by shopping at a farmer’s market or by joining a co-op, but since produce becomes more abundant this time of year, stores will have lots of varieties on sale. Plus, everyone knows that fruits and vegetables contain tons of things that our bodies love. Frugality + nutrition = a happy body. The prices listed below are an average price based on what’s on sale this week so you’ll have something to compare to your shopping list for your local grocery store.